Fall is just around the corner, which means that the kids are officially back to school! While many parents are rejoicing that they’re back to a regular routine, going back to school also means that our kids will be exposed to (and will bring home!) more germs. In this busy and full season, getting sick is the last thing a parent wants to happen to their family. One amazing use for essential oils is that some of them are great for cleaning and disinfecting around the house! You could replace virtually every synthetic cleaner in your cabinet with an all-natural version that works just as well – if not better – using essential oils (here are some recipes that we shared in another post). 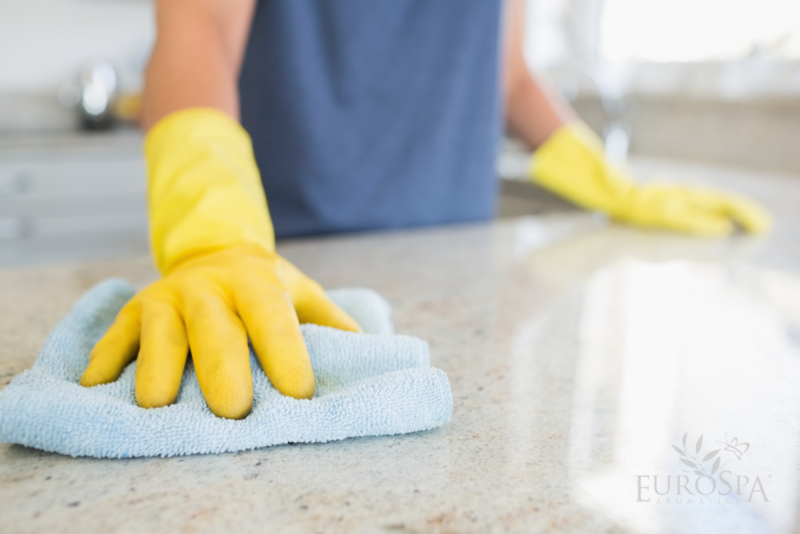 One easy and cost-effective way to keep your house clean during this germy time of year is to fill a spray bottle with distilled white vinegar and add a few drops of Eucalyptus Oil and use it for cleaning windows, sinks, toilets, you name it! The vinegar cuts through grease and kills bacteria, yeast, and mold. The Eucalyptus Oil not only smells fresh and clean but is antibacterial and antifungal. Eucalyptus Oil is naturally antibacterial, antifungal, and anti-inflammatory. Simply turn on the hot water in your shower and wait for the room to get steamy, then spritz a few sprays into the steam cloud away from your face. Breathe in all those wonderful germ-repelling properties! Our Lavender-Infused Pure Eucalyptus Oil Yoga Mat Cleaner is a hard-working multitasker when it comes to keeping your workout space clean and disinfected. Not only can you use it on your yoga mat as the name implies, but also on other fitness equipment! This cleaner uses plant-based oils and enzymatic action to remove makeup, perspiration, body oils, and dirt from your yoga mat and other fitness equipment. Simply spray it where you’d like to clean and pat dry with a towel. Do you have any all-natural ways that you like to keep your home free of germs during the back-to-school season? Please share them in the comments below!